We have a new CSA (Community Supported Agriculture) program format for the coming season, and it's something that we're really excited to be offering. Instead of the usual pre-paid "share" in the farm, customers can purchase a punch card with a 10-bouquet balance. At the completion of the punch card you'll receive an 11th bouquet for free, on us! Why go to a punch card system? The punch card allows for much greater flexibility. Customers can attend any markets they like without having to worry about missing markets. They can pick up more bouquets one week if they're planning to do some entertaining, and they don't have to worry about having cash in hand. We can also hold your card for you on file right at our market stand, so there is no need to worry about forgetting it or losing it over the course of the season! Punch cards can be purchased any time, but they are on sale right now until Nov. 30th at 15% off. 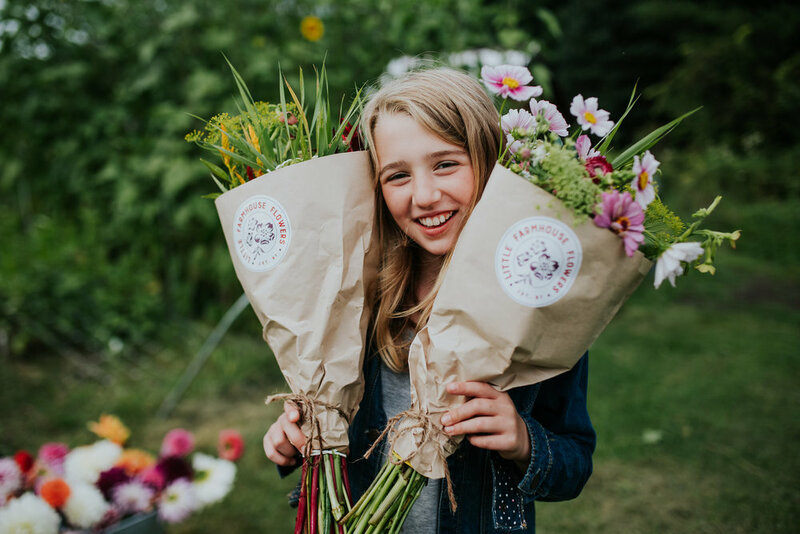 They make a great gift for a local flower lover, and they still support our winter and early season work they same way a traditional CSA share does. Don't forget to head on over to our newly re-vamped store and check-out the new punch card listing. You'll also find a host of other great gifts, like locally crafted gardening aprons and sets with our favorite pruning shears, seeds, and dahlia tubers - not to mention holiday wreaths!